This is the third in a series of small high quality albums of stamps distributed to foreign postmasters, diplomats and other dignitaries. 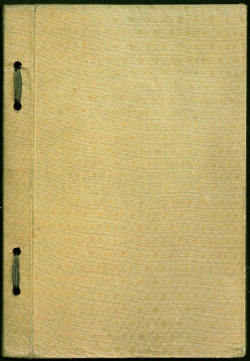 In this instance covers are bound in green/gold coloured silk and the stamps inside are glued onto thick cream covered card. 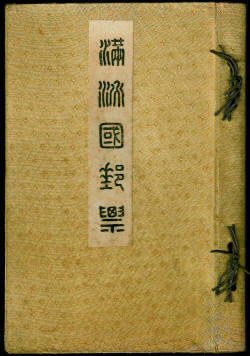 The booklets are tied with dark green silk. This album is complete with the pages still strongly bound however there is some foxing and some of the pages are a little dirty. 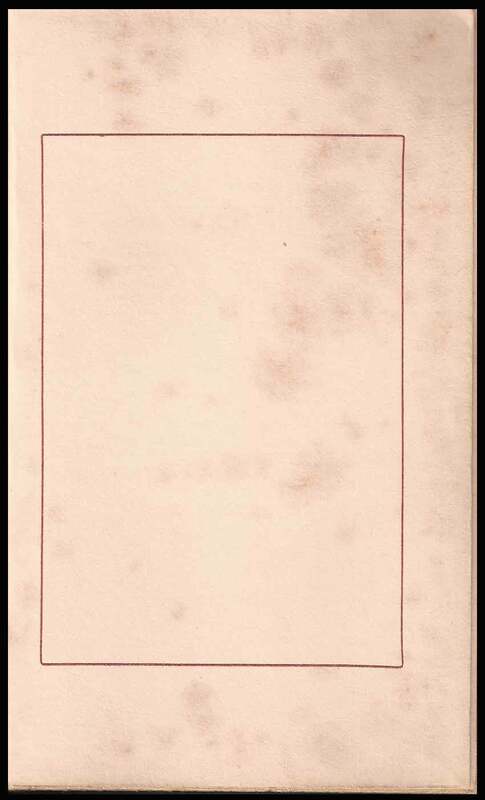 This particular album is hardest to find and few examples are seen at auction. 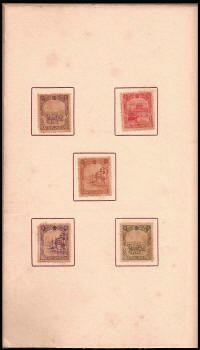 This booklet includes most of the regular issue (definitive) stamps available and in use from 1st December 1936 and probably was issued at this time. 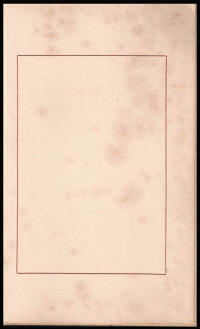 There is space provided for a postcard but in this instance there is no evidence that a postcard had been added to the page. 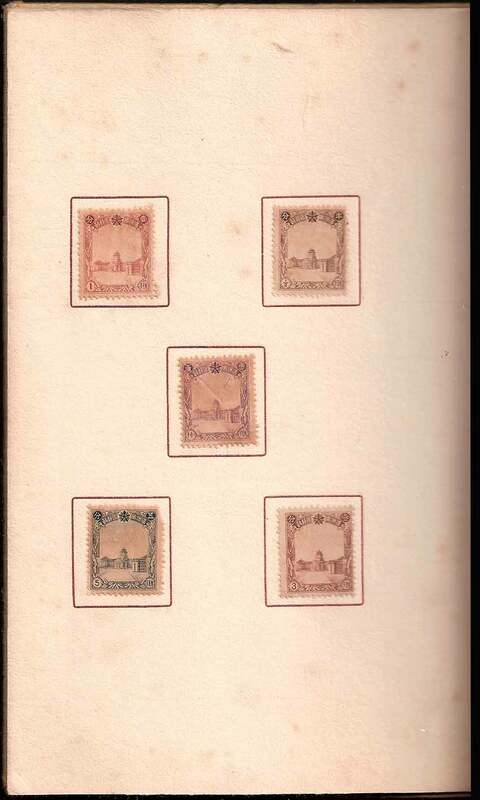 These stamps are also available in a more normal card covered presentation folder with no provision made for a postcard (see below). See also the Fourth Special Presentation Album. 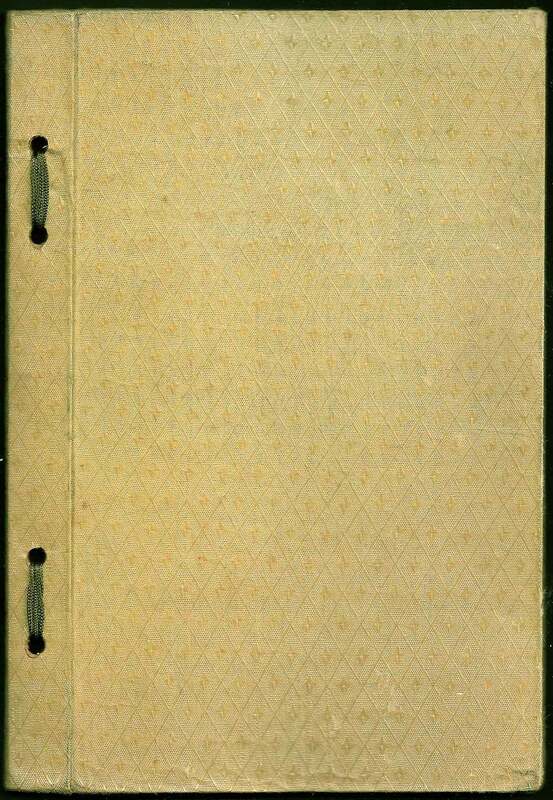 Contents of all pages below. 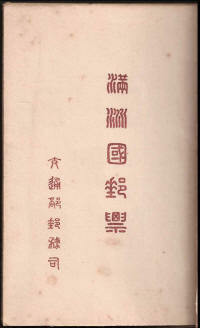 The large seal script characters are repeated from the label on the cover and read 滿洲國郵票 Manchukuo Postage Stamps. 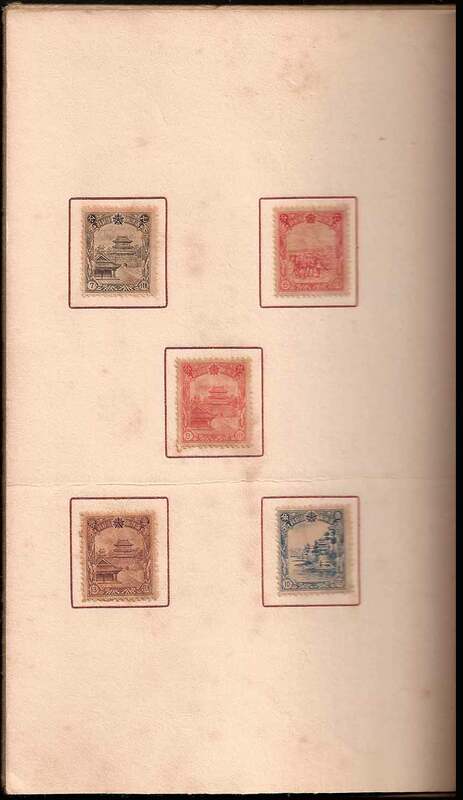 This page contains one each of the following - 1936 Fourth Regular Issue stamps ½f, 1f, ½f, 3f and 5f. 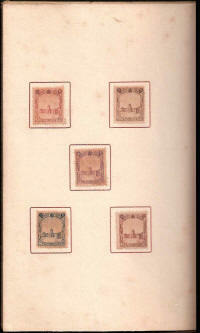 Note - the 2f and 4f stamps are not included. 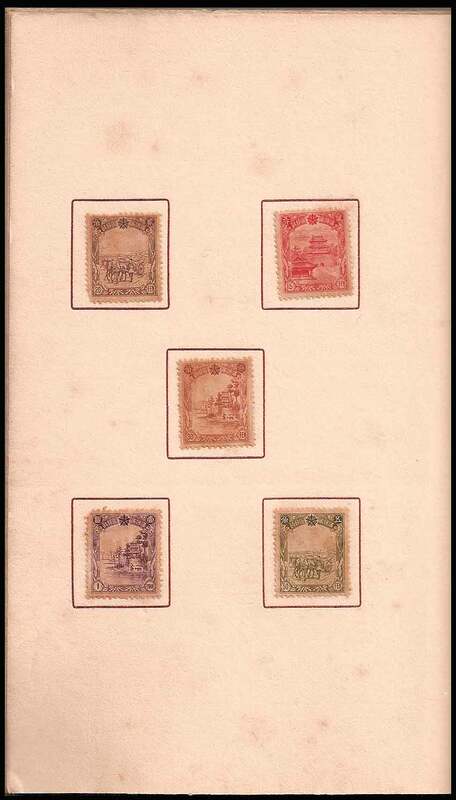 This page contains one each of the following - 1936 Fourth Regular Issue stamps 6f, 7f, 9f, 10f, and 13f. Note - 12f stamp is not included. 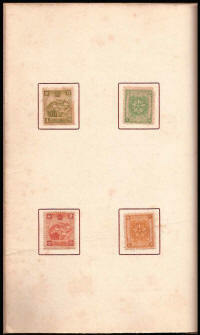 This page contains one each of the following - 1936 Fourth Regular Issue stamps 15f, 20f, 30f, 50f, and 1y.. 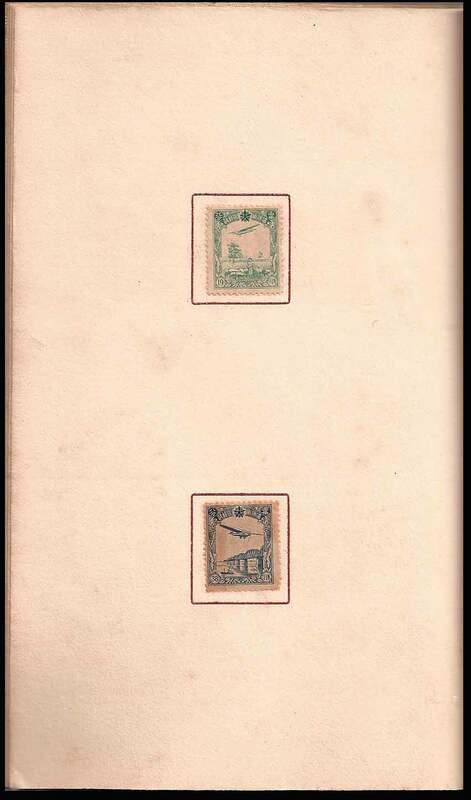 This page contains the first airmail stamps 18f and 38f This page contains the complete Third China Mail issue 2f, 4f, 8f and 12f. 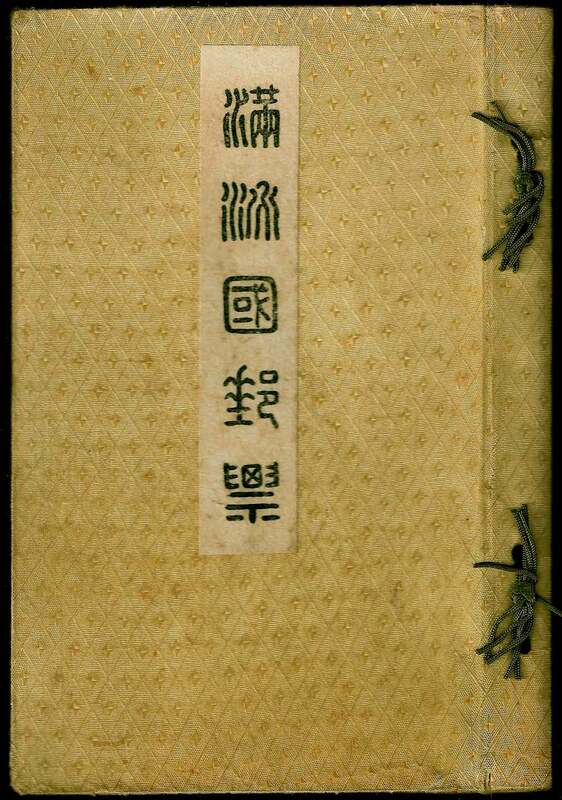 This page has been prepared with a box designed to contain a postcard. No postcard has been attached possibly because plans were already in place for a price increase from 6f to 10f (for International use). 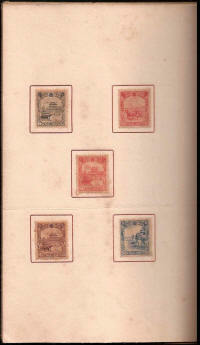 Looking carefully at the stamps in this folder you will see that the stamps included are not all fourth regular issue. The scarce 1½f stamp is missing, the 5f, 8f and 13f have been substituted with a 1937 China Mail issue, perhaps stock of these values had been exhausted when the folder was produced. 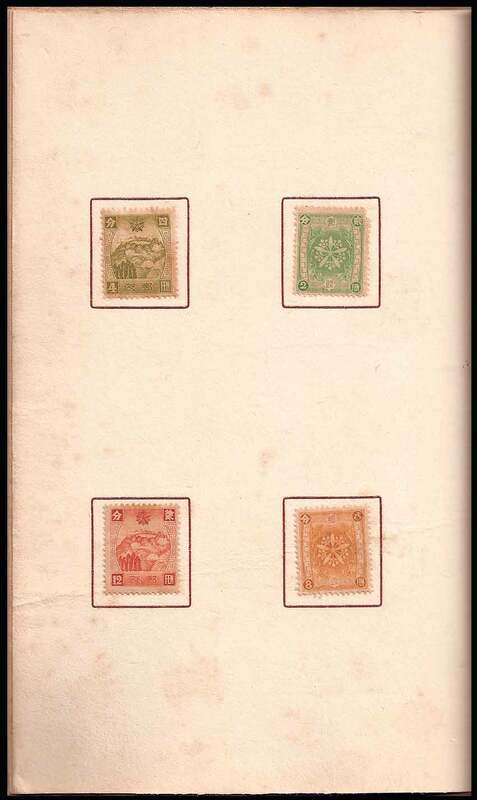 A 2½f China Mail stamp has been added (this value is not part of the original set). So while most of the stamps are fourth regular issue this folder is more representative of the stamps available at the time. 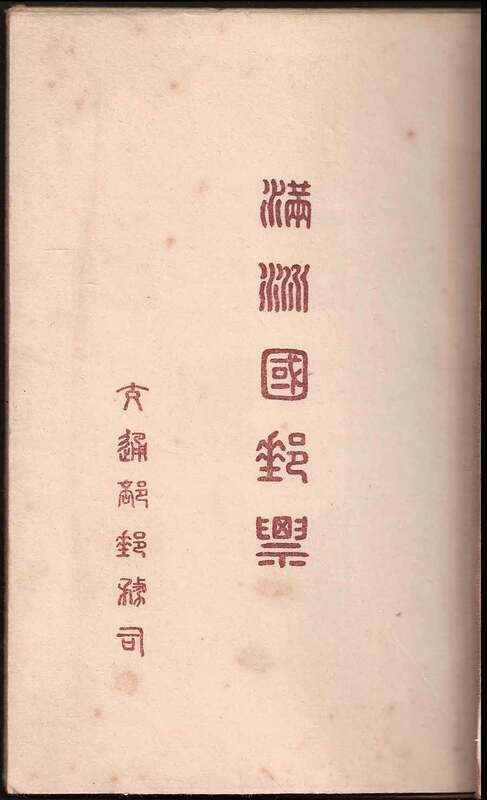 The identification of the postcards is based upon "The Catalogue of Postal Stationary of the Japanese Occupation of China, Part One, Manchuria" by Dr. Robert M. Spaulding Jr., with additional information from a number of other sources.